Food has a way of bringing people together. What better way to experience Kalamazoo than to sample and savor some of our most local and home-grown flavors? Whether you label yourself a foodie, or you’re just passionate about eating *raises hand*, you need to put these food-themed events on your list of things to do in Kalamazoo! Mark your calendars – this Friday is the LAST Lunchtime Live! If you're craving some healthy food, come on down to Bronson Park this week, 11:30-1:30! Live music, great scenery, fun summertime games, and amazing food…Lunchtime Live has it all! Get the family out of the house this summer and head to Bronson Park in Downtown Kalamazoo for a Friday afternoon on the town. Experience Kalamazoo’s local food trucks and homegrown musical talent. The Annual Salsa Cook-Off is held every July as the kick-off to Summer Restaurant Week in Kalamazoo. Ribfest is a three-day event at the Arcadia Creek Festival Place in Downtown Kalamazoo. As one of the original festivals held downtown, Ribfest is now in its 30th year and attracts over 10,000 people each summer. The event features national and local rib vendors that sell ribs and chicken in outstanding barbeque sauces. To compliment the rib vendors, additional food vendors will be offering side items and sweet treats to top off the food experience at Ribfest. Sweet water Oberon donut holes with dipping sauce. Kalamazoo’s Donut and Beer Festival takes place on the field at the ballpark in downtown Kalamazoo. 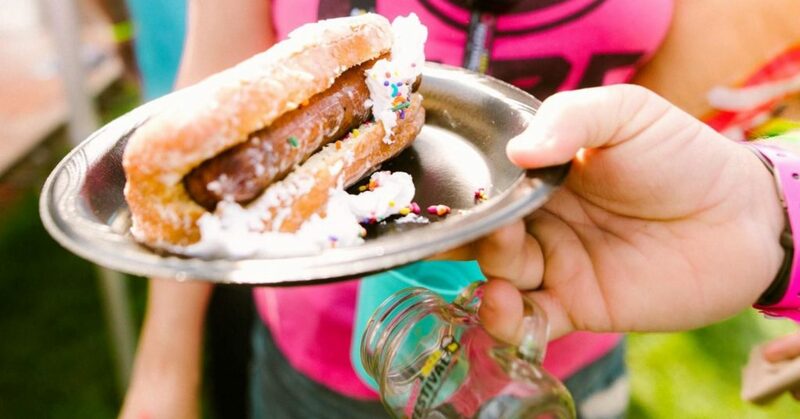 Attendees can expect one of a kind donuts, craft beers, ciders, live music and fun. There will be yard games, contests, on-field activities and much more. Each attendee will receive donut samples, drink samples & a mason jar sampling glass. This is an event for all ages and includes non-alcoholic “Cider” tickets. For the love of tacos, and a good time, the Kalamazoo Growlers Baseball Team is hosting a crazy new event highlighting local food vendors for their unique take on the versatile taco along with a tequila sampling bar, exotic mixed drinks, and festive entertainment—- lucha libre wrestling, mariachi band, and taco judging contest. The Annual Chili Cook-Off is held every January as the kick-off to Winter Restaurant Week in Kalamazoo. At Louie’s Annual Gumbo Cook-Off, you’ll find the best Gumbo from some of the most talented chefs from all over West Michigan! This event doesn’t just feature great food, but excellent music too. Not to mention, Louie’s is the oldest bar in Kalamazoo that acts as an escape from the busy city! Start your day with delicious pancakes smothered in real Michigan maple syrup! Walk along a wooded trail with a naturalist for a maple sugar tour and a visit to the brand new Sugar Shack! Experience our amazing Birds of Prey and Creature Features up close. The whole family will enjoy this sweet experience at the Kalamazoo Nature Center! Don’t miss a visit to the DeLano Homestead during the festival to experience pioneer maple sugaring and life in the 1800s. Horse-drawn wagon rides and demonstrations by blacksmiths and fiber artists will round out the activities. The Kalamazoo Hot Dog Walk is all about having fun, making new friends, sampling great food and helping those in need in our community. Participating in the hot dog walk includes a hot dog from each of the six restaurant partners and spots on the route, a commemorative t-shirt and transportation. Don’t be fooled by the name, these guys bus you to and from each location, because who can walk that many miles after eating so many dogs?